One dress – multiple ways to wrap. Setting itself apart from the typical bridesmaids dress, the label that was founded by Ariane Goldman in 2007 offers a collection of completely convertible, luxurious and timeless gowns that are flattering for every body shape. The dresses are destined to be worn time and time again. Note: Since we would like to show you different ways to tie the dress, please book your appointment in advance with us, especially when you are coming as a group. Price range: 320 – 498 Euro. Dresses in every color of the rainbow. The label from the USA offers a broad range of different styles. The look is modern, feminine, timeless, elegant. Celia Dresses offers the dresses exclusively in Germany. Price range: 229 – 459 Euro. Classic, modern or romantic? There are soo many choices. 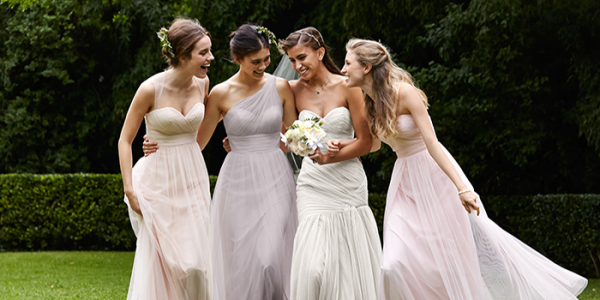 The label that belongs to USA Watters Group offers mix and match bridesmaid styles to create a more interesting ensemble and to accommodate the different shapes of your bridal party. Price range: 279 – 359 Euro.